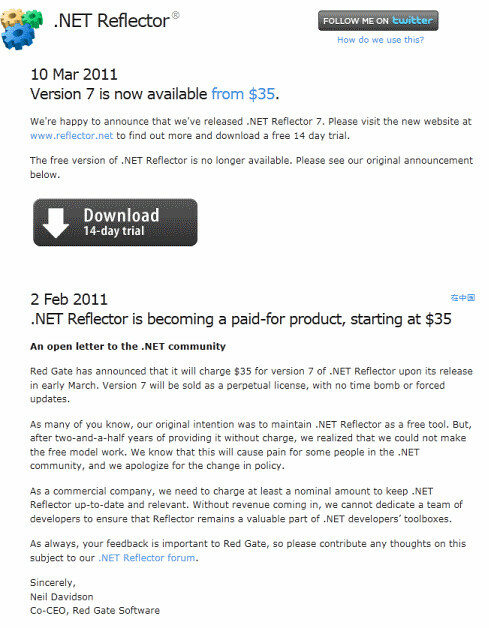 I’ve blogged about .NET Reflector acquisition two years ago. I called news “gruesome” and reflected (sic!) on my (recent then) experience with the Red Gate. ["free community 30-day trial"] – … isn't our plan. We've not ironed out exactly what we'll do with Reflector (because we've not had a chance to interact with the Reflector user community) but we bought it because it is popular and has a passionate user base - we'd be fools to damage either of those things. As it turned out he spoke the truth: there is no plans for the “Free Community 30-days trial” there is a “14-day Trial” version, it is a big difference, folks. Neither I can deny that sqlserversentral.com is still around – as a marketing tool, collecting emails from subscribers (oh, wait! I remember the site now – it is in my Google excluded searches list, because when you are in a hurry to find an answer, it offers you to register). Comments sum it up nicely. I can’t agree with some emotions, but I share the feelings. I sincerely hope that commercially senseless Spolsky and Atwood both are or will be millionaires – god speed! Stack Overflow is an example of how you can turn a respect of the community to a profit. Sad but true – trust is unprofitable. As developers in hearts, the decision makers are probably sympathetic but there is nothing personal – it’s strictly business. There is still a hope though, and example being the Scott Gu’s team, which most likely has no commercial sense either, although it probably costs the Microsoft more, than Reflector to the Red Gate. P.S. Oh, by the way, we’ve eventually given up on our SQL Toolbelt Continuous Integration project. We got stuck in those licensing cobwebs, our management lost patience and I haven’t considered Red Gate for my automaiton projects ever since. I 100% agree with you on this. Red Gate deserves your scorn.